Announcing the forthcoming opening of a new exhibition entitled A Right to Freedom – Martin Luther King, Jr., at the Nobel Museum in Stockholm on September 29, 2018. The exhibition—curated by Ashley Woods and produced by the Nobel Museum and Nobel Media in association with The King Estate, brings attention to the importance and necessity of basic human rights, and promotes the 1964 Nobel Peace Laureate’s vision of equality and justice for all through nonviolence. Importantly this year marks the 70th anniversary of the Universal Declaration of Human Rights, and the 50th anniversary of the assassination of Martin Luther King, Jr. This is the first time that the Nobel Museum and Nobel Media has collaborated with the family of Martin Luther King, Jr. and The King Estate. As such Bernice A. King, the youngest daughter of Martin Luther and Coretta Scott King will travel from Atlanta to Stockholm to open the show on Friday, September 28, 2018 at 4PM. “As we commemorate the 50th anniversary of my father’s death, I wish to commend the Nobel Museum for its decision to dedicate a new exhibition to his life’s work, and the promotion of human rights. I am equally pleased to hear that my mother Coretta Scott King’s role and contribution as an activist in her own right will also be highlighted. I believe that my parent’s message of social justice and equality is as important today as ever before, and look forward to being in Stockholm to open the show”, says Bernice A.King, CEO of The King Center: the official living memorial in Atlanta, Georgia, USA, founded in 1968 by Coretta Scott King to advance the work and nonviolent legacy of Martin Luther King, Jr. The exhibition will present a rich variety of material such as photographs, objects, film, as well as original interviews with people who knew King personally, including the Jamaican American singer Harry Belafonte. It will also feature a ”Dream Builder”, a digital application where visitors can build their own dream. “Of all the Nobel Laureates, Martin Luther King, Jr. recipient of the 1964 Nobel Peace Prize, is the most sought after by online visitors. As such, we are positive that this exhibition will appeal to visitors from around the world. We also hope that it will inspire young people to follow in his footsteps. We are especially pleased that King’s daughter Bernice A. King, CEO of The King Center will join us for the exhibition opening, which I cordially invite you to attend at the Nobel Museum, on September 28th at 5 pm”, says Olov Amelin, the Director of the Nobel Museum. A full educational program will allow students the opportunity to learn more about Martin Luther King, Jr., and how his method of nonviolent action continues to inspire other movements around the world. We hold a press conference in the exhibition area at the Nobel Museum in the morning of the opening day with Ashley Woods, exhibition curator, Dr Karcheik Sims Alvarado, historian and exhibition consultant and Olov Amelin, the Director of the Nobel Museum. RSVP to ragnhild.glimregn@nobelmuseum.se. You can also book an interview with either one of the participants. They remain in Stockholm during the week following the opening. In the evening of the opening day we present a panel discussion with Bernice A. King, Dr Karcheik Sims-Alvarado and Ashley Woods. The discussion is moderated by Olov Amelin. For high resolution press image, please contact Ragnhild Glimregn. 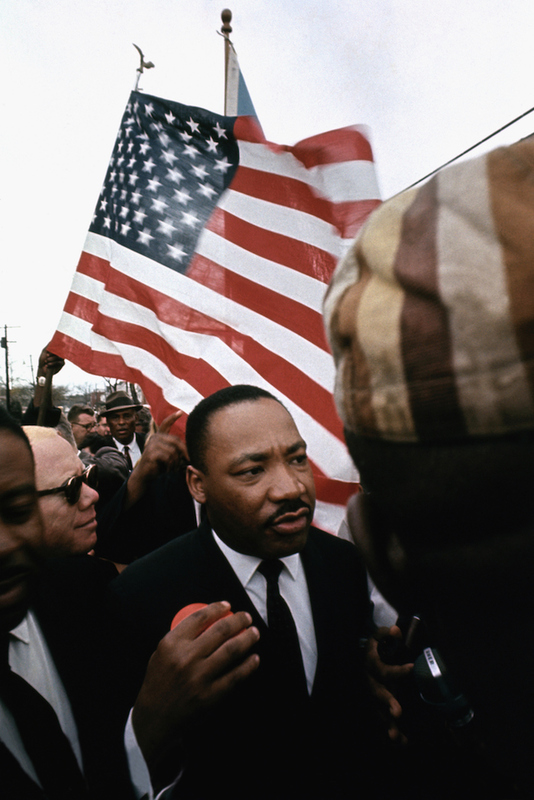 Caption: Martin Luther King, Jr., leads the march from Selma to Montgomery, 1965.